The term is used to describe the speckled appearance of the tissue. Used in many instances in radiology as well as even some pathology textbooks and journals mentions this term while describing the tissue but most commonly used while described the tissue during MRI interpretation. Highly vascular tumours such as a paragangliomas which contain flow void and areas of haemorrhage they are Glomus tympanicum , Glomus jugulare , pheochromocytoma and , carotid body tumour. ‘Salt' represents the hyperintensity of mass due to areas of hemorrhages in these hypervascular tumors. ‘Pepper' represents multiple black dots due to signal void of vessels. The appearance is seen on T1 w images, may be seen on T2w images. Such lesions show ‘blooming’ low signal intensity hemosderin staining on T2*GRE, intense enhancement on post contrast due to the hyper vascularity of the mass. A less common usage for the term is for vertebral haemangiomas which have a courser black and white dotted appearance especially on axial T2 and T1 images (salt = fat, pepper = coarsened trabeculae). Rare, slow-growing, hypervascular, benign but locally invasive tumor. Often noted as an incidental finding. May go unnoticed due to non specific and insidious onset symptoms. Predominantly occur in female, common during their fifth and sixth decades of life, more common on the left side. 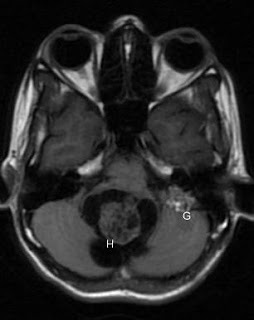 A 40 yo female presented with hydrocephalus due to mass effect of a Hemangioblastoma (H) at the floor of posterior fossa. The Glomus jugulare tumor (G) with typical salt and pepper appearance on T1w images noted as an incidental finding.